Millions of pounds are still needed to complete a memorial and visitor centre to bomber aircrew before the last veterans die. The International Bomber Command Centre (IBCC) said 78 veterans had died since the beginning of the year, out of 1,100 remaining worldwide. The site - set to open in September - still needs £2m in donations and events are being held to raise the cash. IBCC director Nicky Barr described the shortfall as "heartbreaking". She said: "I personally feel we've let them down. We are losing veterans at such a rate and we are desperate to see the centre open." 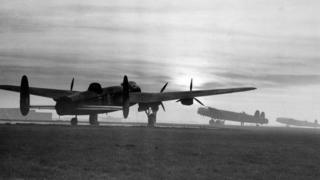 The Lincoln attraction is to honour their efforts with exhibitions, information and accounts from aircrew and survivors. Officials said fundraising efforts had been hampered by a number of break-ins at the site, including one at the weekend. Thieves took items intended for a forthcoming open day, including two generators, food and drink. They also shredded a wreath left at the base of the memorial spire. Almost half of the 125,000 Bomber Command lost their lives and it is estimated between 300,000 and 600,000 civilians died as a result of large-scale area bombing near the end of the war. Mrs Barr said "these boys were forgotten after the war, and were publically ignored". She added: "And yet, night after night they went up and faced the biggest risks of any unit in World War Two. "For us as a nation to have turned our back on them is a very sad injustice, and we've got an opportunity to put it right while they are still alive."